Japanese and German researchers have found evidence that suggests the middle of Earth’s mantle holds as much water as the planet’s oceans. An open question for solid-earth scientists is the amount of water in Earth’s interior. The uppermost mantle and lower mantle contain little water because their dominant minerals, olivine and bridgmanite, have limited water storage capacity. 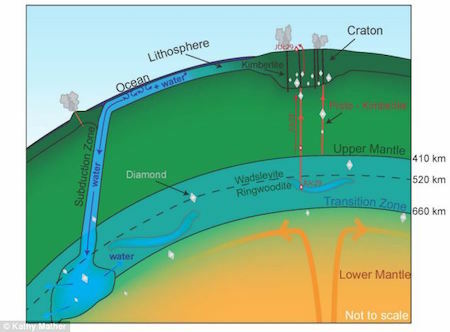 In contrast, the mantle transition zone (MTZ) at a depth of 410 to 660 km is considered to be a potential water reservoir because its dominant minerals, wadsleyite and ringwoodite, can contain large amounts of water [up to 3 weight % (wt %)]. However, the actual amount of water in the MTZ is unknown. Given that water incorporated into mantle minerals can lower their viscosity, we evaluate the water content of the MTZ by measuring dislocation mobility, a property that is inversely proportional to viscosity, as a function of temperature and water content in ringwoodite and bridgmanite. We find that dislocation mobility in bridgmanite is faster by two orders of magnitude than in anhydrous ringwoodite but 1.5 orders of magnitude slower than in water-saturated ringwoodite. To fit the observed mantle viscosity profiles, ringwoodite in the MTZ should contain 1 to 2 wt % water. The MTZ should thus be nearly water-saturated globally. Science fiction writer Stephen Baxter has created a series of novels, starting with Flood, that describe a near-future Earth in which the oceans are rising. In the story, global warming melts ice sheets, which raises ocean levels. However, the water keeps rising. With the weight of ice removed, Earth's inner water rises. I'm not going to reveal what happens.